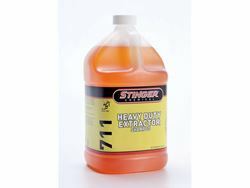 Stinger's HD Extractor Concentrate is a special low foaming heavy duty extractor cleaner fromulated for use on interior fabrics. Rinses clean without a soapy residue or can be used as a pre-spot. Available in gallons, 5 & 55 gallon containers. Dilute up to 1:160.